Jason Saves the World: Gone to Amsterdam! It's August already. 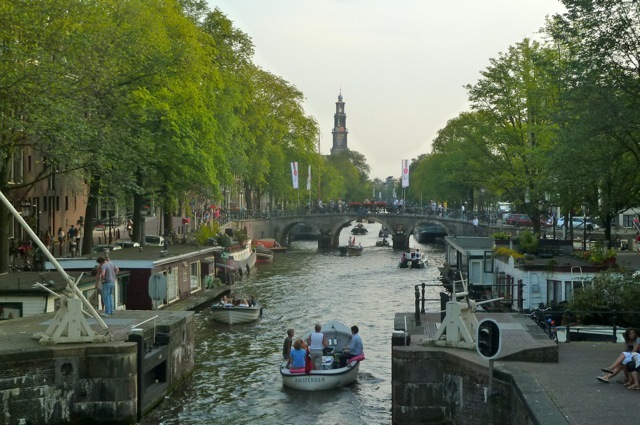 I was lucky enough to come into possession of a one-way train ticket from Berlin to Amsterdam, so it was a no-brainer that I simply had to use it. 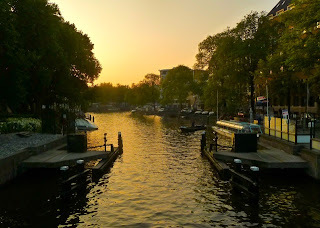 It's Amsterdam, after all, and even though I had been there already, there was still more of the city and lifestyle to experience. It was a welcome break from rainy Berlin. So on Monday morning, I woke up and hastily put my stuff together and rushed to the Berlin Hauptbahnhof. My haste wasn't good enough: I arrived just after my scheduled train left. But I didn't worry too much; there was a train I could take every 2 hours. However, I didn't want to wait 2 hours in Berlin, so I stared at the train schedule until I found another train that headed toward Amsterdam, which I was able to get on because it was running late. The train passed through Magdeburg, Hannover, and Osnabrück, and it wasn't too crowded. The passengers around me complained about a man sitting a couple rows away who was talking too loudly on his phone. It was odd, because I didn't find him to be a nuisance at all - I guess I'm just used to Americans being loud and talkative everywhere. 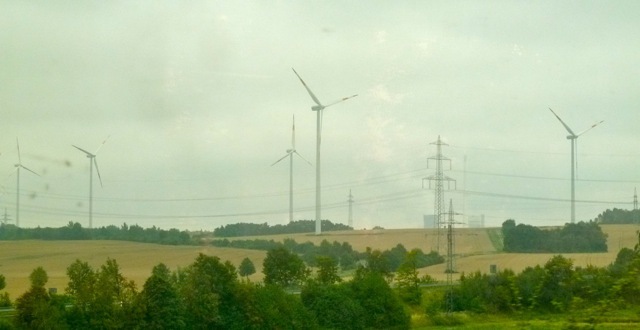 The train filled with passengers after Hannover, and just past Westfalen a few mountains rose in the distance - this part of Germany wasn't as flat as I had imagined. As we headed west, the clouds began to part and for the first time in 5 days, I saw sunshine. The scenery didn't change too much as I headed into the West of Germany; I noticed plenty of windmills and then fields growing corn. The buildings changed from the East's mix of dilapidated Soviet-era and über-modern architecture to a more average set of European styles. As the train headed into the Netherlands, "Scotty Doesn't Know" came on my ipod, and I couldn't help but smile as I thought about my own Eurotrip. 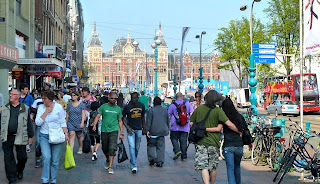 At 17:05 I arrived at Amsterdam's Centraal Station. 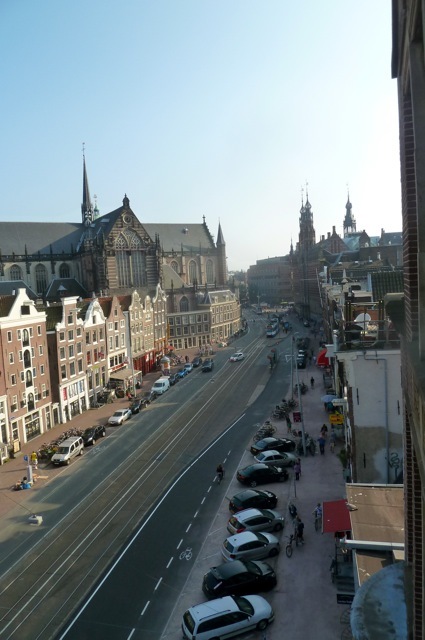 I contacted my host, Paul, and walked over to his place, which is right in the center of Amsterdam, just a block away from the central Dam Square. Along the way, I had to push my way through crowds of hundreds of tourists. 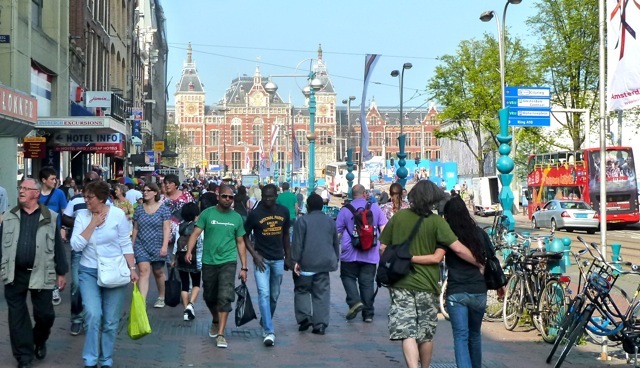 It was unbelievable - the last time I had seen so many tourists might have been at Times Square, but there might even have been more in Amsterdam. 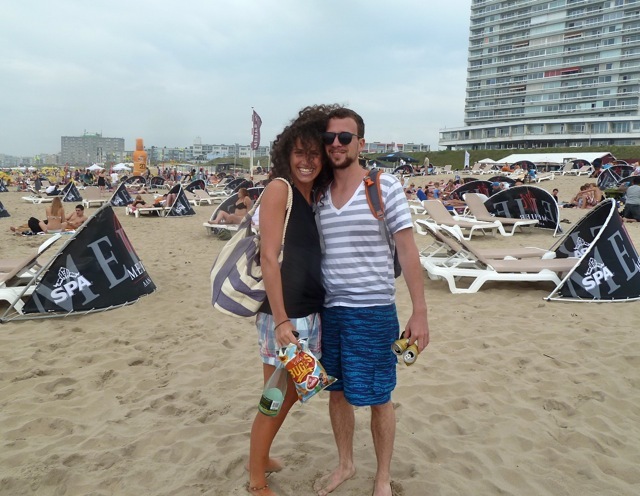 Many seemed to come from Spain or Latin America, but there were also plenty of British people in A'dam for a few days of summer partying. Also, the bikes! Amsterdam (and the Netherlands) is a center for bicycling, and you need to watch out because people ride their bikes pretty aggressively sometimes! I'm definitely not in LA anymore. After settling in to Paul's apartment, he and I walked around to explore. 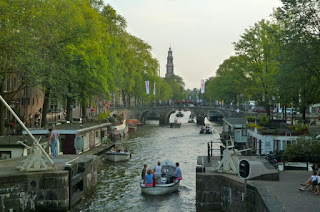 The canals seemed familiar but also very picturesque. In the hazy late-afternoon sun, the light twinkled upon the water, and it all looked so serene. It felt good to be back in Amsterdam, and this time, without any snow! Paul and I ended up having some pommes and then went to Vondelpark, where we shared a beer. There were plenty of people just hanging out, picnicking or riding their bicycles. A seemingly homeless man was training his dog to fetch a stick that he repeatedly threw into the water. Paul works for a local cooperatively-owned cinema, and as a result, he has free tickets to watch any film. So we went to another cinema and wanted to watch a movie that Paul said was good (I forgot the name), but the website's showing time wasn't right, so the only movie we could watch was Harry Potter and the Deathly Hallows: Part 2. Which was good, although I didn't watch many of the prior Harry Potter films. Then, we stopped at a coffeeshop on the way back before going to bed. The next day was warm and sunny as I awoke on Paul's short couch. His friend Alexandra had called up and decided to go to the beach. Paul asked if I wanted to join, and I enthusiastically accepted. We soon packed up and headed out, stopping by a store for Paul to buy some swimming trunks (he left his in Sweden). I didn't bring any but swam in my basketball shorts. We got to the train station and hastily bought tickets before cramming ourselves onto the train. And was it crammed! There was barely any place to stand on the train - somehow Paul and I squeezed our way into seats next to two nice older women. The beach was Zandvoort aan Zee. Paul and I waited for Alexandra to arrive on the next train, and we went onto the very crowded beach to find a space. We squeezed in to a decent spot and took turns jumping into the chilly water. The water was somewhat murky and brisk. It was warm and sunny, at least for a few hours, before some clouds moved in later in the afternoon as we left. 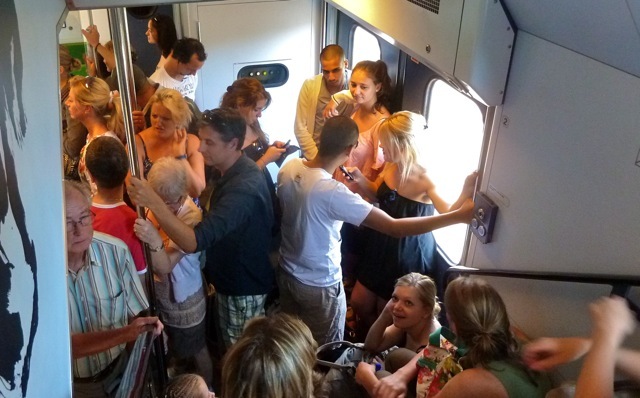 Back on the train to Amsterdam, it was crowded but we somehow got seats. Paul had to go to work, but I spent the evening with his flatmate Annemarije. 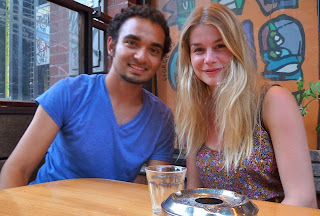 She and I walked around the city and ended up getting some filling Indonesian food in the northwestern part of town. Our server was nice but somewhat curt. I felt so awed by the buildings in the city - they were all so picturesque, it seemed unreal, like I was in a theme park. But no, they actually were real and people lived and worked in those buildings. After a beer at a cafe, a stop by the grocery store, and a joint from a coffeeshop, we returned to the apartment and watched some clips of Whose Line Is It Anyway, which we found absolutely hilarious.